If you’ve ever wondered how a 4WD system works, this post is for you. We’ll explain the basic function of 4WD, dive into the history of 4WD, then talk about how modern systems work on top of the basic system. We’ll also define some terms and offer some general advice for choosing the right 4WD system. 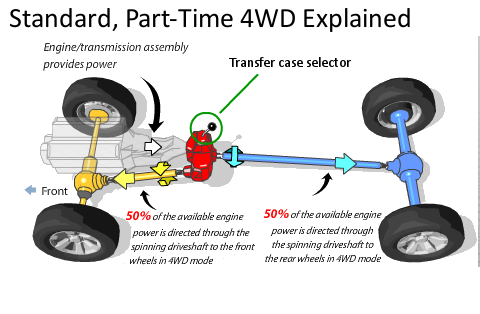 Ever wonder how exactly 4WD works? Here is what you need to know. Of course, anyone who’s driven a 4WD knows that this system has no benefit when it comes to stopping your vehicle – it’s only useful for getting going. In the “old” days, 4WD systems were really basic. 4WD vehicles had a transfer case, which would take power that was headed for the rear wheels and redirect half of that power to the front wheels. The transfer case (t-case) was engaged with a lever in the vehicle’s interior, typically mounted next to the gearshift. To activate 4WD, you would put the transfer case in 4 high or 4 low, then get out of your truck and “lock the hubs.” You’d turn the hub locks on the wheels, which would lock the front axle shafts to the wheels, and BOOM – 4WD. Away you go. This system – which is know as “Part Time 4WD” – worked just fine for decades, but in the 80’s and 90’s, automakers started experimenting with automated systems for locking and unlocking hubs, as well as engaging the transfer case. Additionally, all wheel drive (AWD) systems began to gain in popularity, blurring the line between AWD and 4WD in the minds of many consumers. Axle – a shaft which connects one or both wheels to the drive line and rotates. Center Axle Disconnect System – A 4wd engagement system using vacuum and sleeves to engage the front drive axle(s); center axle disconnect systems are used instead of wheel hubs. Differential – a type of gearbox within the front and rear axles. Hubs – Locking or unlocking a hub will connect or disconnect the wheel from the axle shafts; Some new vehicles still offer manual locking hubs in 2014, but the are increasingly rare. Locking Differential – A locking differential ensures that both wheels connected to the differential turn at the same rate. These types of differentials are typically found on the front axle of heavy-duty 4WD vehicles. Transfer Case – A special type of gearbox connected to the transmission which transfers the engine power to the front and rear driveshaft. What Happens To A 4WD System When You Turn? When you turn a corner, the wheel on the inside of the turn doesn’t travel as far as the wheel on the outside of the turn. First, it creates torque inside an axle shaft. Too much torque – or too much sustained torque – will damage parts. 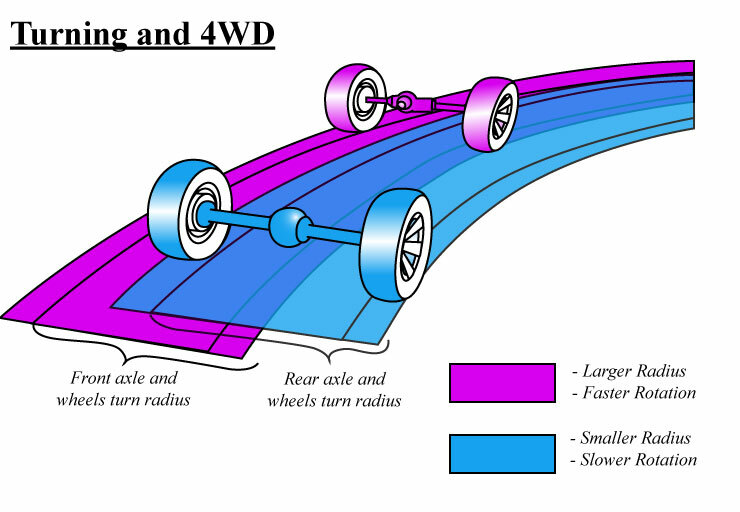 The inside wheel has to turn to match the speed of the outside wheel at some point, so it will break traction with the ground as the turn takes place. The act of “breaking traction” can be disruptive if the road surface offers a lot of traction (like pavement). 4WD vehicles turned on paved roads will often “hop” if they’re in 4WD (especially in 4LO). There are also binding problems between the front and rear axles. The front and rear axles are connected to one another thru the driveshaft. If the front is turning faster than the rear (because the front of the vehicle is traveling further), the driveshaft is torqued. Just as different wheel speeds can cause damage, differing axle speeds can cause driveshaft breakage, t-case damage, etc. The rear wheels will break traction to resolve this problem, just as the inside wheel will do when connected to a locked differential. Tell drivers that they should only use the 4wd system on loose surfaces, where binding is impossible because wheels can easily break traction. Insert slip differentials between the inside and outside wheels, and also between the front and rear axles. Slip differentials – and limited slip differentials – send power to wheels while simultaneously allowing the wheels to spin at different rates. A slip – or open – differential eliminates any binding issues. Most Full Time 4WD and AWD systems use slip differentials. It should be noted here that a simple open differential allows connected wheels to spin as fast as they can. If, for example, you have two wheels on an open differential, and one of these wheels rests on ice while the other rests on dry pavement, any power applied to this differential will go to the wheel sitting on ice. This is because the wheel that can spin fastest gets all (or almost all) of the power. Thus, there’s such a thing as a “limited slip” differential, which uses a clutch or a viscous coupling to balance power between the wheels. 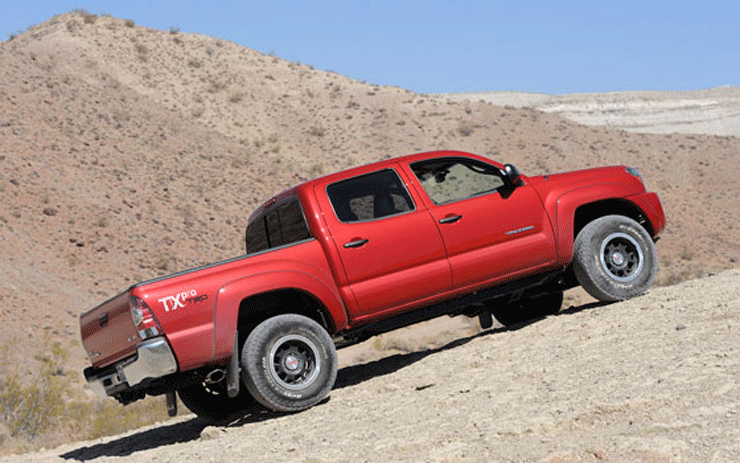 The Tacoma – like a lot of pickup trucks – uses a part-time 4WD system. The front differential locks, which means that the Tacoma’s 4WD system should only be used on surfaces with limited traction. Using the Tacoma’s 4WD system on dry pavement should be avoided, especially if you plan on taking any turns. In terms of engaging the front wheels, the Tacoma uses a center axle disconnect system. Basically, a 4WD Tacoma is just like a 2WD Tacoma until the 4WD system is engaged, as the front axle is disconnected by default. This is a different approach than some other automakers, which choose to use locking hubs. While there are arguments about the superiority of one approach over the other, most of these arguments are pointless. The simple fact is, locking hubs and center axle disconnect systems are only as good as the company that makes them. NOTE: There is a discussion to be had about the fuel economy impact of a center axle disconnect system vs. a locking hub system, as it’s likely that center axle disconnect systems increase drag on the driveline and sap a little fuel efficiency. However, most automakers claim that this drag is minimal…so, it’s probably not worth talking about. Part-Time 4WD – Most true 4WD vehicles are part-time 4WD, which means 4WD must be engaged by the driver somehow. Otherwise, the vehicle is in 2WD. This is the system most pickup trucks use, as it’s incredibly rugged. However, it requires the driver to be aware of road conditions. The Tacoma, of course, uses a part-time 4WD system. Instead of using hubs, the Tacoma uses a center axle disconnect. Full-Time 4WD – Purists will argue that most “full-time” 4WD systems are actually AWD systems, as most full-time systems have a limited slip differential on the front axle. Because this differential doesn’t lock like a traditional 4WD setup, it’s not technically 4WD. However, some full-time systems use a front differential that can be locked, and others automatically engage and disengage the transfer case depending on road conditions….which means the functional difference between these systems and part-time 4WD is small. Generally speaking, a full-time 4WD that’s fully comparable to a part-time system will have a setting for “4 low.” If you’re looking at a vehicle that advertises full-time 4WD and doesn’t have an option for 4LO, you’re looking at an AWD vehicle rather than a true 4x4x. Still, AWD/Full-Time 4WD is a decent option for anyone who wants 4WD but doesn’t want to have to think about engaging and disengaging it. All Wheel Drive (AWD) – All four wheels get power all the time. The front and rear differentials in an AWD system are designed to “slip,” which is to say that one wheel can turn faster than the other. This prevents binding while turning, thus ensuring the system won’t get damaged during daily use. However, because the differentials slip, they’re not as capable off-road as a vehicle with a locking differential. AWD systems are pretty excellent for most normal driving situations, but they’ll struggle in a true off-road situation. Thus, if you’re serious about off-roading (or have to venture off-road for work), you’ll probably want to avoid vehicles that advertise themselves as 4WD. Associate Editor Tim Esterdahl is a married father of three who enjoys golfing, trucks and working outside. Tim also writes for our sister site, TundraHeadquarters.com.